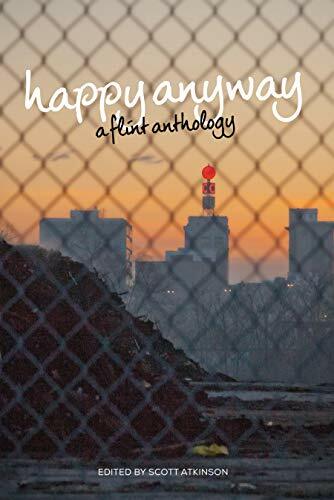 Happy Anyway is a collection of short essays by current and past denizens of Flint, Michigan—the hometown of General Motors. Flint, once a symbol of American industrial power, is now an equally iconic American neoliberal city largely abandoned by the state to fend for itself. Each piece seeks to grasp the multiple meanings of being part of, and shaped by, a city on the verge. On the verge of what is open to debate, but the overall prognosis is not a particularly good one after over 45 years of steady decline materialized in brownfields, superfund sites, bulldozed neighborhoods, unpredictable violence, vulnerability, and fear. The 1970s oil embargo dealt Flint its first catastrophic blow—big, heavy, inefficient gas guzzlers just didn’t fit a new energy-bitten America. The 1994 North American Free Trade Agreement ultimately did it in—cheap labor and new factories in Mexico sent General Motors across the border or into right-to-work states in the U.S.
An iconic automobile brand and its largest single manufacturing base were casualties of the churning vortex of globalization that has shuttered large and medium industry across the rustbelt Midwest and elsewhere. Each essay draws from rich personal experience that captures the bitterness and resignation of loss along with a chaser of hope. Galvanizing the essays are thoughtful meditations on the meaning of place and situatedness as experienced in the midst of a radical, neoliberal downshift. Home, as they say, is where the heart is—good, bad, or indifferent. Philosopher Edward Casey would tell us that we are inextricably place-bound. By virtue of being human we have the sensory and cognitive-cultural apparatus so that our sensory bodies absorb and reflect the places that imprint upon us. Place is, thus, also ineluctably attached to memory and identity. It is not surprising, then, that the anthology’s foundational theme of “home” is a reflection of our “placeling” status. In a town now well known for leveling entire abandoned neighborhoods, Jan Worth-Nelson writes eloquently of home as an anchor with deeply memorable roof beams, arches, pillars, and porches that are a hallmark of Flint’s vintage homes. A transcendental refuge against a chaotic and unpredictable world. Teddy Robertson adroitly extends the metaphor to stolen heirloom jewelry. As with much in Flint, things are taken never to return. These heirlooms had a Kula history—value derived, not from some intrinsic value, but from their ownership and history coupled with the memory-identity features embodied in them. Memory and identity lost to thievery. Home exists within a downsized and discarded neoliberal city that is Flint. Neighbors—or what’s left of them—become the custodians and financial supporters right down to mowing the lawn at a once-municipal golf course in Robertson’s Mott Park neighborhood. Staci Sherman tells the tale of self-policing because of a reduced police force that responds to “high-priority” crimes, but little else (and then in twice the time of the national average). These are the effects of a neoliberal city with a shrunken government and tax base where the burden of social support shifts from the state to the citizen. That Flint is considered the detritus of the state is underscored by Connor Coyne’s consideration of that abandonment through Flint’s recent poisoned-water scandal as seen through the lens of a simple baby’s bath in that tainted water. A basic activity made dangerous. Other effects derive from the neoliberal city, most notably a broad sense of vulnerability that refracts across the volume’s essays in a variety of ways. Through the tale of a beloved stolen bike when a mere child, Layla Meillier recounts how this was her first deep experience of vulnerability. She finds that vulnerability, exposure, and trust interweave in complicated ways. She asks the provocative question about whether the will to trust creates an even more robust opportunity structure for more expansive exposure to risk and danger. To this her answer is no—without vulnerability there is no love and then what? Yet Eric Woodyard’s fine essay on the shooting death of a friend at an after-hours liquor store strikes a different cord. Vulnerability, trust, and structures of danger find themselves in lethal mix. An innocent stop for more booze crumples to the ground in a tragic end. Wrong place, wrong time. Meiller’s cautious openness contrasts with Woodyard’s hubris of youth. Yet Mailler also knows the dangers of vulnerability when she speaks of being in a continuous posture of pre-emptive strike against threat and danger as a general condition of living in the neoliberal city. She does not want to wind up on the “wrong end of the human condition.” For she has been confronted with real, unpredictable, and potentially lethal danger—no fault of her own. If the vulnerability and trust live in an interesting dance, the flip side of that trust exists in an equally complicated relationship with a learned mistrust. Stephanie Carpenter provides something of an antidote to the trust dilemma with a version of what the Chinese would refer to as guanxi—social relationships that afford protection in a world without strong rule of law or a system of legal protection. “Connection[is] a means of self-protection” where people in your network have your back. Flint is a highly contextualized place. It very much defines as much as it is defined by those who inhabit it. Volumes editor, Scott Atkinson, asks what is on the other side of the horizon of a place so defining. A number of essays address people’s inability to test the horizon, as well as the disorientation of forging past it into new and unknown worlds. One can only admire people’s endurance that hang in there and try to make it work, as well as those who sail past the horizon.